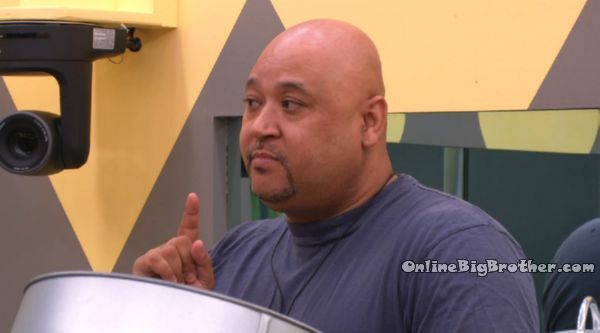 Adel says we can’t leave Paul hanging, we’ve got to shake the s**t out of this house! 7:40am – 8:25am Big Brother wakes up the house guests. All of the house guests being to wake up and start getting ready for the day. Today there will be Andrew’s Nominations and the Power of Veto Competition. Andrew, Kenny and Jon head to the kitchen to eat breakfast. Meanwhile in the bedroom Adel comments to Arlie that he is tired of being stressed in this game and refuses to be stressed any more. Alrie says he just wishes there was a single girl in the house. Kyle and Adel have a quick conversation in the storage room. Adel says we can’t leave Pj (Paul) hanging. We’ve got to shake the s**t out of this house! They’re walking around laughing in our face! We can’t let that! 5:44pm Rachelle and Sarrah Sarrah shares how she has difficulty dealing with anxiety. In her regular live she can “Power throw it” but in the house it’s a bit harder. RAchelle says she hasn’t felt herself since entering the house. They are suspicious how Paul, Kyle and Adel were out in the hottub for so long talking. Sarah doesn’t know 100% if she is safe ans she has no clue who is going up. She claims to have heard PAul and Adel’s name get thrown out there. RAchelle says her name has been mentioned. Sarah hasn’t heard that. 1:40AM Feeds come on for the mystery Houseguests. They 3 mystery players start freaking out looking at the feeds..
Allison says she likes Kyle. Sounds like a big chunk of the houseguests are still up. We cannot see what cam 1-4 is showing but we can watch the mystery houseguests commenting on their feeds. Sounds like PAul isn’t very happy..
3 Mystery house guests chatting about the bobble head houseguests in the Mystery room. Allison says she likes Anick but thinks Neda give her bad vibs. 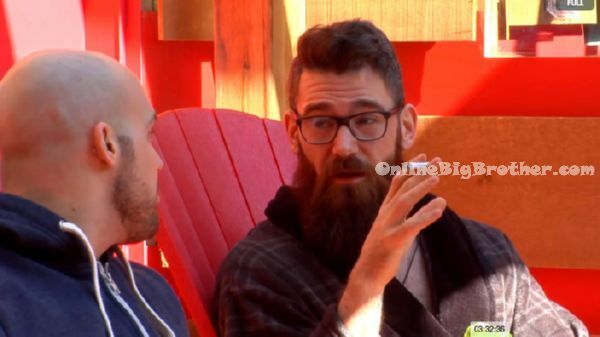 Scott says he heard a rumor before entering the house that a relative from a Big Brother Canada Season 1 cast member was going to be cast. Scott thinks that Kenny is Emmett’s brother. Paul won the first HOH and proceeded to get a terrible case of HOHitus. The first 12 hours of the feeds was packed full of him making deals and talking game. Paul nominated Anick and Andrew, His reason was Anick was the first Girl to get off the ice block during the HOH competition. Andrew was the first Boy off. 10:30am In the kitchen – Anick, Kenny, Andrew, Adel and Arlie are talking about people sending food back in restaurants. The talk about random things and about different diets. All of the house guests are waking up and getting ready for the day. Meanwhile in the bedroom Sarah, Ika, Sabrina, Rachelle, Neda and Kenny talk about how this experience will bond them together for life. 11am ON the living room tv screens the house guests notice the Live Eviction Today displayed. They then see something else on the screen and comment on how they could see Paul talking without audio. 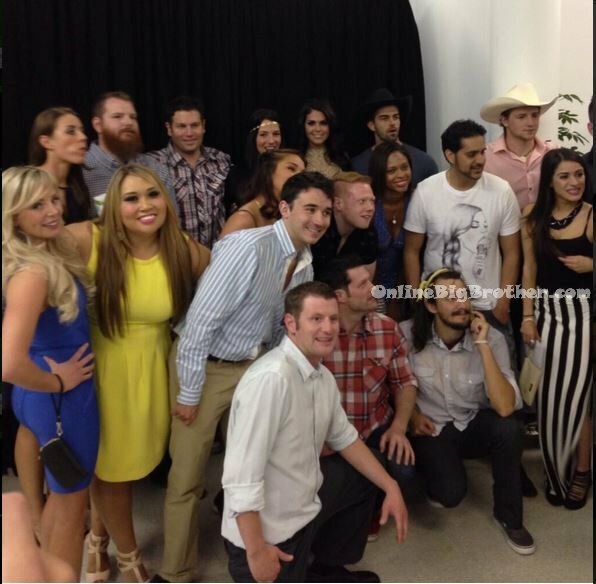 They comment on how Big Brother f**ked up and then the camera turns away. 6:45am Arlie is the only house guest awake. He’s in the kitchen doing the dishes. He then heads to the diary room, presses the button and gets let in. When he emerges again he is holding a dish. He returns to doing the dishes. He heads to the bathroom. When he comes out he washes his hands and says “Day eight baby! DAY EIGHT!” “Life is so good! Life is so good!” “You got this, you got this!” He then heads back downstairs to the storage room to look for something to eat.